STORY: A little bear Plusha saves his fluffy friend Tukki and their land from aliens. You may collect or buy super items to become Super Plusha. But it isn’t necessary. You have just freed your friends. French, Italian, Spanish and German. The game contains 6 LEVELS + 1 SECRET LEVEL. 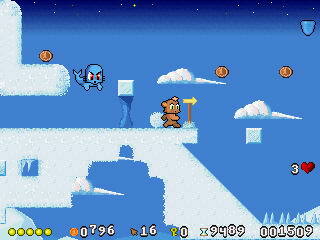 Each level contains up to 20 levels of a parallax background. Some levels aren’t linear. In the each level, there is a BOSS. You can buy some special items at Kuzya’s spiffy shop. If you have “Snake’s Continue Token” then you can save your game. (Some of these guys don’t work with us now but we’re grateful them for their support). THANKS: Evil Dragon, Aj0, Mr.Spiv, FireFly, Valken Lee, ZardosJones, _mp_, DarkFader, Stifu, Rino, GPZIGI, Bobbyb, Russian WIZ support site: ???? and the GamePark Holdings Co. LTD team for support.